Emily Mardell (Burt) is a Registered Dietitian, and, simply put, a true food fan. 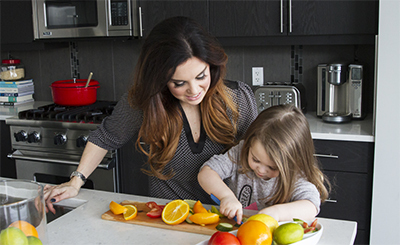 Her passion for food, nutrition and education lead her to found Food First Nutrition Consulting. Emily is dedicated to providing expert, innovative, client-centered services that foster improved health, fitness and culture. A graduate of Memorial University of Newfoundland with a Bachelor of Science in Biochemistry/Dietetics, Emily is a proud member of Dietitians of Canada and the College of Dietitians of Alberta. Regular on CTV Edmonton Morning Live and Dinner Television Edmonton, Emily shares creative ideas to help you put food, and your health, first. Emily’s career direction was heavily influenced by her mother, Joy Burt, two-time World Powerlifting Champion as well as by her own involvement in sport. She maintains a keen interest in Sports Nutrition and dedicates much time to exploration and education in this dynamic field. Emily is an avid runner and sports fan. Lately, she’s enthusiastic about strength gains and eating more “planet-friendly.” Her greatest joy is her four-year-old daughter, Cela, and, if she had to pick anything to do, it would be cooking with her favourite mini-chef. To learn more about programs and services contact Emily today.